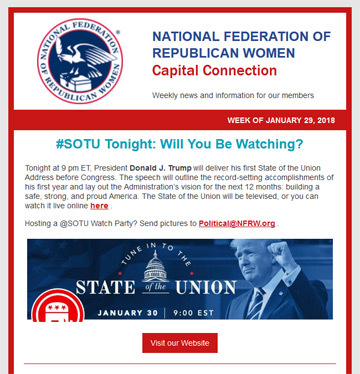 NFRW members receive the weekly Capital Connection digital newsletter. The National Federation of Republican Women has one of the lowest membership fees in the country – just $10.00 annually per member. For this nominal fee, members receive a variety of services and access to political activities and information. A robust national website and member database management system that connects the entire Federation and provides key membership services, including administrative access and capabilities at the club level. The NFRW’s electronic communications, including the weekly and monthly newsletters and political briefings, and free or nominally-priced publications like the Leader’s Guide, Membership Handbook, Legislative Advocacy Manual, and outreach/recruitment materials. The Member Center, a private online network on the NFRW web site available to members only. The Member Center includes a member directory and the Digital Resource Library, which features committee and issue-related resources and materials, general organizational publications and forms, event information, graphics, and more. Assistance in creating new clubs, launching or updating a state or club web site, and other membership services. Sample materials, multimedia and resources that assist states and clubs with public relations and fundraising efforts, membership recruitment, campaign and issue advocacy programs, meeting planning, literacy and armed services initiatives, leadership development, community service, and more. Campaign Management Schools, Legislative Day at the U.S. Capitol, and other programs, workshops and seminars that offer members the opportunity to meet national Republican leaders, discuss key issues, and develop leadership and professional skills. Networking opportunities and the ability to meet and develop relationships with women from across the country through online discussion forums and national events such as the biennial convention and annual board meetings. NFRW’s national events include interactive workshops, exciting speakers, and informative programs and discussions. Representation in Washington, D.C., including the services of a professional staff and maintenance of NFRW headquarters – located in Alexandria, Virginia, a few miles from Capitol Hill.